Bring exquisite luxury to your bedroom décor with this sleigh bed. 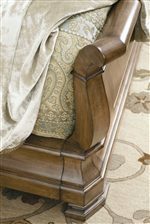 It features lovely curves and ornately carved wide feet. Bathed in a warm brown Cognac finish, the farmhouse appeal of this piece will be a marvelous addition to any décor. Available in queen, California king, and king sizes. The New Lou Queen Louie P's Sleigh Bed by Universal at Zak's Home in the Tri-Cities, Johnson City, Tennessee area. Product availability may vary. Contact us for the most current availability on this product. 07175F Louie P's Sleigh Footboard 5/0 1 70" 6" 30"
07175H Louis P's Sleigh Headboard 5/0 1 70" 5" 60"
07175R Louie P's Sleigh Rails 5/0 1 10" 3" 82"